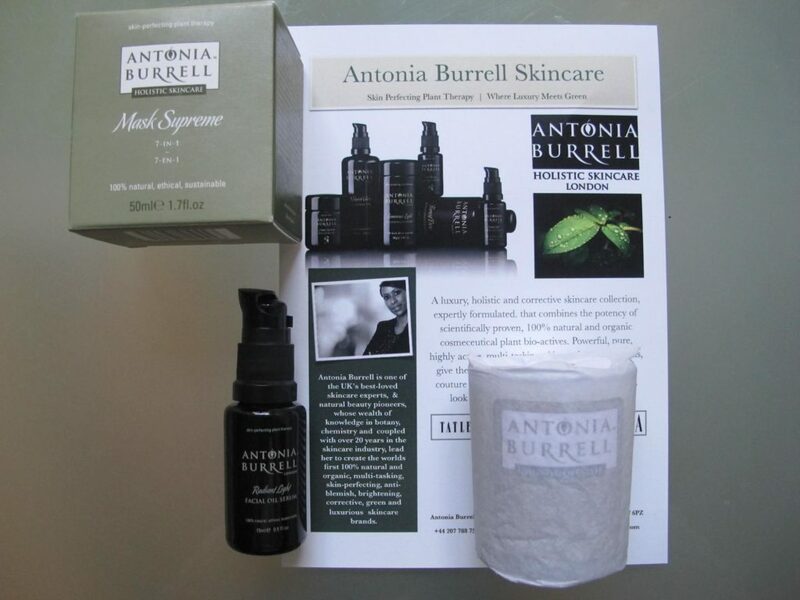 When the weather turns colder it affects not only how we feel but how we look, so I thought it would be nice to review two of Antonia Burrell‘s products, one a facial oil serum, the other a newly launched 7-in-1 mask – both might appeal to your skin which might be feeling dry and lacklustre. Late last year I attended the ‘Meet the Makers‘ event with Antonia at Wakeman Road, where she talked about the effect of plants on mind and body and her preference for simple skincare & effective beauty routine. Antonia is going to be celebrating her 25th year in the beauty business this year and her drive, in part, stems from her passion for healthy skin. She says that a good skincare therapist has an intrinsic desire to help the client to solve their problems and that’s why one of the main areas of her focus are ageing & problematic skin. This bright orange, the colour of sea buckthorn berries, Facial Oil serum has a texture of the oil and smells like gently roasted coffee beans, which is a perfect wake up call for skin and the senses in the morning. It has a lovely rich texture but sinks quite quickly into the skin, adding a subtle sheen and a tiny bit of colour to your complexion. Antonia combines 18 plant extracts and bio-actives that together aim to illuminate & brighten your complexion, particularly if it is looking dull and tired. It should also help to counteract pigmentation, sun damage, dark spots & blemishes, as well as help your skin withstand the damage from environmental factors. Frankincense: helps to calm, rejuvenate and brighten the complexion particularly if your skin is looking tired. Also helps to deal with blemishes and scars. Myrrh: known for its abilities to help repair the skin and address skin sensitivities, particularly when your mind is stressed. Rosewood: its uplifting smell helps to lift your spirits while also stimulating your skin cells. Sea Buckthorn: one of the richest natural sources of Vitamin A, it works on accelerating the rejuvenating process and restoring skin’s matrix and delaying the signs of ageing. Galbanum: helps to speed up metabolic process in the skin, thus speeding up tissue regeneration. Olive Leaf: a potent antioxidant that helps to fight free radical damage. Antonia recommend using this product morning and evening. Pump two to three drops of it on the tips of your fingers and massage it into the cleansed skin, upwards. Avoid the eye area but do extend it to your neckline in the evening – start with your neck and work upwards, taking deep breath and inhaling the uplifting but soothing aroma. When you use this oil serum in the morning it will also act as a nice base for make-up – if you use creamy blusher for example, it will glide on the skin – less skin dragging leads to a healthier, smoother complexion. When your skin is prepped with the right type of skincare your make up will also stay longer and you will look ‘fresher’ throughout the day. This multi-tasking mask harnesses time-release Oleosome technology and combines skin perfecting plant alchemy with stress melting aroma. You can apply the mask to your cleansed face ( if after cleansing the skin it feels dry, you have stripped it and need to change your cleanser, according to Antonia ) and remove it with a warm cloth after ten minutes or for added benefits and when you feel your skin needs some extra TLC, keep it on overnight. 1. Time released technology used to create this mask will improve elasticity, moisture retention and luminosity. 3. Helps to slow down the ageing process and protects cellular DNA from oxidation. 6. Renews & refines skin’s texture, leading to a smoother complexion and firmer skin. 7. Helps to reduce blemishes & inflammation. Phoridium Persicinum Extract: this micro-algae ( using them in skincare is becoming quite a trend ) will stimulate the synthesis of thioredoxin in the dermal and epidermal cells thus helping to slow down the ageing process in your skin cells, repair sun damage, as well as brighten the complexion. Bentonite Clay: this clay has a sponge-like texture which draws out and absorbs dirt & congestion throughout the electrical attraction of particles. Antonia chose this type of clay due to its mineral concentration goodness, detoxing effect and enhancing skin cell renewal effect. Lactic Acid & Abyssinian Oil: An alpha hydroxyl acid ( AHA ) lifts away dead cells & promotes growth of new cells without irritating, as well as restoring the pH balance of the skin. It also addresses the issue of pigmentation and stimulates collagen production. Abyssinian Oil helps to smooth existing wrinkles and improves tone and texture. Mango Butter: this butter protects the skin from the adverse effects of weather and UV radiation, as well as improves skin’s elasticity. It is known for its anti-oxidant, anti-inflammatory and anti-ageing properties. Essential Oils: Geranium oil elevates stress, tension and anxiety, helps to balance the skin and imparts a feeling of relaxation. Lavender Oil repairs and regenerates the skin while also calming it. Frankincense Oil promotes mental relaxation and helps to clarify and rejuvenate the complexion. Australian Eucalyptus is included because of its anti-inflammatory benefits. This mask is an effective product to help improve the health and condition of your skin and you do see its effect even if you only use it for 10 minutes once a week, no wonder that Antonia’s team calles it ‘a personal facialist in a jar’. If used overnight, you can expect to see a revitalised, plumper complexion in the morning with an added bonus of a healthy glow. From my own experience with skincare I can only add that if you don’t have a regular facial ( how often to have one depends on your skin & age, as well as knowing a facialist whose skill and advice you trust ), using a mask in the evening at least once a week will definitely bring its benefits when done regularly. Would love to try,my budget for skincare\cosmetics at the moment is zilch ! Nice review. I’m very interested in plant therapy as I trained as an aromatherapist. Thank you Christine for your lovely comment. I have been a fan of aromatherapy & plant therapy for many years so it is nice to see more and more skin & bodycare products emerging on the beauty market.